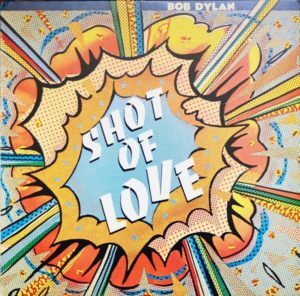 Flawed, yes, but Shot of Love is one of the more compelling Bob Dylan albums for quite a stretch both before and after. It has a sound resembling a lot of commercial rock of the day, like Pete Townshend‘s Empty Glass. It is music recorded in high contrast, stripped of subtle shadings and grainy texture. The major problem, as with Dylan’s next album Infidels, is what was left off the album. “Property of Jesus,” “Lenny Bruce” and “Dead Man, Dead Man” all should have been dropped in favor of the much superior tracks “Angelina,” “Need a Woman,” “Caribbean Wind,” and, especially, “You Changed My Life” all left in the vault (but later released on Biograph and The Bootleg Series Volumes 1-3: (Rare & Unreleased) 1961-1991) — a demo version of “Every Grain of Sand” with Jennifer Warnes adding vocals rivals the official version and might justify a swap too. Also, the single B-side “The Groom’s Still Waiting at the Altar” tacked on to later versions of Shot of Love bolsters the album. With those changes, this one would be secular enough, more emotionally bare and open, and would maintain an immediacy throughout. Dylan is engaged on just about everything here, and his vocals reflect considerably more effort than fans would find in most of his albums for at least a decade or so to come. This one may not be essential, but if the final tracklist had been done properly it very well could have come close.